Have you ever heard a phrase that struck a cord deep within you, as if the words were made especially for the moment you were living? I’ve never repeated a Bible Study that I’ve previously done, until now. Recently I re-started “Crossings” as a way to introduce the study to a friend. At first I was afraid the study would seem too familiar, since it has been less than a year since we piloted it for the group leader. But now, only two lessons into the seven week series, I know it will impact my life as strongly now as it did the first time around. However, this time around it has a fresh new meaning, and different parts of the work are sticking with me than when I did it before. Today’s lesson was about Joshua, the man who was trained by God to become a leader for his people. During his training he learned from one the best: Moses, who often had the incredible honor and privilege of spending one-on-one time alone with God. Joshua was a devoted servant to God and an invaluable aide to Moses. During the times that Moses met with God, Joshua stood behind Moses, allowing Moses the full glory of the opportunity to be with God alone, but also protecting Moses from any sort of ill will that could have befallen him during this time of vulnerability. Joshua was, in fact, “holding down the fort” for Moses. 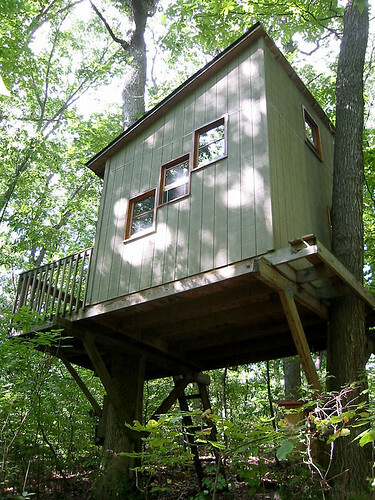 Botsford Tree House, a photo by Voxphoto on Flickr. It’s an issue I can relate to. As the mother of three young children, I’m holding down the fort for them in myriad ways: carefully keeping a watchful eye to shield them from harm, proudly allowing them to shine in their various moments in the spotlight, gradually encouraging them to grow in faith and spend time making their own godly decisions. As the wife of a busy subspecialist, I am holding down the fort at home, keeping our house a safe haven to protect him from the pressures of a demanding job and a stressful work environment. I am holding down the fort in our marriage, keeping things intimate, creating time for our relationship, finding ways to spend quality time together. I am holding down the fort socially, as I navigate our calendar and make decisions on where to spend our most valuable commodity: time. Sometimes it feels like I am left to hold down the fort while other people are able to enjoy life to the fullest. But I know now that God is preparing me for all that He has planned for me, and that He thinks the fort is important enough to protect. And I find it a great honor to be in charge of it. In fact, I can think of no greater joy. Holding down the fort: When I heard those words today I knew they were meant for me. The next time I feel like life is passing me by, I’m going to clean up my fort a little, and make sure it is adequately prepared for whatever may come.